It amazes and astonishes, flabbergasts and flummoxes me that there are so many people who don't like vegetables, who cannot cook vegetables and who don't understand the benefits of eating more plant based foods. It's cheaper, healthier and far easier to consume the green stuff than to spend the green stuff on McProcessed In-and-Out fast/fatty foods. Like my culinary hero, Mr. Mark Bittman espouses, ya gotta eat more of a plant based diet to keep this Green Earth Green! In honor of Earth Day, and as a service to my fellow readers, I'm offering up a little cooking lesson of simply prepared veggies. From time to time I plan to write lessons on the wonders and delights of simpler fare. Should you have any questions or would like to see a featured post, send me an email or post a comment. I would love the input of ideas from ya'll! String beans are one of the many veggies I eat on a daily/weekly basis. Yes, as a child, I ate many a can of The Jolly One's salty, grey/green French cut string beans, and yes, they were disgusting. Not much better is the bird's eye viewpoint of Mr. Clarence's frozen food world - mixed square cuts or freeze dried/frozen green beans. Stringy or freakishly shaped, these versions of chilled to the max vegetables are a tad better for you but ultimately it's best to think in terms of KISSing the cook and preparing your own haricot vert, snow peas or sugar snap peas. You will be surprised at what your taste buds have been missing. The original idea - mind you I have none of my own, came from my chef'ing days working at Whole Foods Market and Andro's Fine Foods at the Reading Terminal Market. At Whole Foods, we would actually deep fry the string beans in canola oil! Those were cooked by the 50 pound case, daily. They tasted great, but oye vey, the fat calories and greasy mess! This technique is a prime example of how to totally screw up a perfect food and fool people into thinking that they are eating something "healthy". I know a lot of vegetarians and vegans who would be shocked to learn that those Chinese green beans in black bean sauce they've been consuming are higher in fat and calories than the General Tao's Chicken their friends are scarfing down, and that most likely the green beans were fried in the same vat 'o grease as the Generals chicken! Mr. Andros had the right idea when it came to whole food cookery. His delicious cakes may have been full-fat affairs, drenched in artery clogging buttery caramel sauce, but the savory meals were not so bad. We would make several pounds of steamed green beans with dill, olive oil, salt and pepper for our prepared fare. It's an easy 5 ingredient recipe. Variations for seasonings would be using a mustard vinaigrette, a simple balsamic and olive oil dressing or my Essential Soy Sauce dressing. One recipe begets another, get the basic technique down, i.e. steaming, boiling, saute, grill or roast your vegetable and the dressing choices are up to your imagination. Use a 4 quart or large sauce pan and heat the 5 cups of cold water over high heat until it comes to a boil. When the water begins to boil, add in 2 tablespoons of kosher salt and 2 tablespoons of the dried dill. While the water is heating, wash and trim the green beans. Keep them as whole as possible, there's no need to cut the string beans into small pieces. 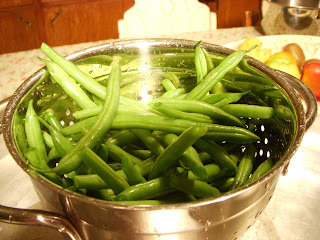 Once the water has come to a boil add in the string beans, stiring once or twice to fully submerge them. Allow the water to come back to a rapid boil, then reduce to medium low and cook the string beans for 6 minutes. After 6 minutes, drain the string beans in a colander and shake off any excess water. Put the cooked string beans either back into the pot or put them into a large serving bowl. 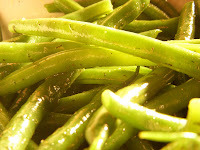 Season the string beans with the reserved salt, dried dill, 1 tablespoon of olive oil and freshly ground black pepper. Serve hot, at room temperature or cold. Enjoy! These are delicous! In 'n Out? I thought this 'burger chain was only in CA and AZ..
ah, if only. Sadly, the In & Out chain is only a West Coast Treat. But we have Pat's, Gino's & Jim's Steaks! Philly is the Cheesesteak capital of America! Hi! Chanced upon your site when I searched for "cooking string beans". Am also a health conscious cyclist and a foodie. Love your blog and the photos and the recipes! - Lela from Sydney, Australia.